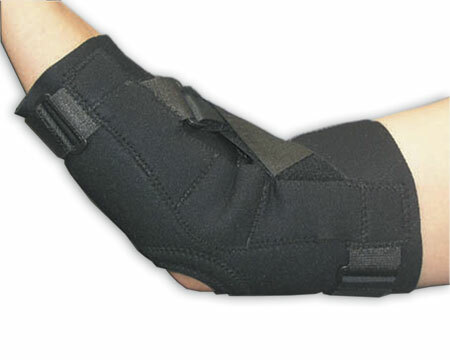 The PRO #407 Hyperextension Elbow Brace features a pair of lightweight aluminum hinges, fully enclosed in neoprene pockets, to insure proper tracking and stability through flexion and extention. Two adjustable hook and loop straps in a criss-cross configuration allow the wearer to set the amount of extension control desired. Additional hook and loop strapping at the top and bottom of the support limit stretch while customizing the fit of the brace. An opening at the elbow eliminates pressure on the joint, aids in proper positioning of the sleeve and dicourages migration in extreme activities such as football. Available in black only. Been using it for about a month for boxing sparring. Works well but you must adjust it to fit your comfort level. I had to go to a larger size to fit my bicep with more comfort. For the money and for the job it does, I've very pleased. Got great customer support and appreciate that. I suffered a hyperextended elbow from being armbarred in jiu jitsu and this brace has allowed me to train again. I've used it for a week and it's held up to some brutal sparring so far.